Some parents wish that they could live out their dreams through their kids, for instance, a pilot might want his son to enrol in the same school that he did when he was a wee lad, charting the son’s life path before he even knows what a Pokemon is. I say let your kids discover for themselves what their lot in life is, you cannot simply force someone to live out your life as it would make the entire growing up process a painful and difficult one. If you want to know whether your little one could be the next John Carmack, then playing Doom is not the answer, but rather, purchasing the $24.99 c-Jump Computer Programming Board Game. 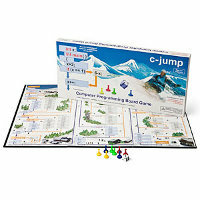 This unique board game will let you learn the basics of computer programming, where the main objective is to race down the mountain – by thinking like a computer programmer. Pretty cool, don’t you think so? How about programming a portal to open up on one end with another at the destination to take a short cut? This unique board game targets middle school aged geeklings as well as the older ones who are new to the world of programming, where it teaches basic programming language commands such as “if”, “else”, and “switch”, while introducing the variable “x” concept. Have fun while learning, that is what life is all about.